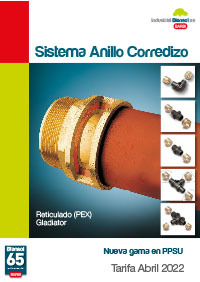 Gladiator system assembly sequence - Industrial Blansol, S.A.
to the end of the pipe. 1. Replace BARBI classical ring with the special GLADIATOR rings. 2. Add the end joint to avoid corrosions caused by the contact between the aluminium of the pipe and the brass of the fittings. 4. Proceed to assembly exactly in the same way as with the traditional BARBI system.